Now there is definitely nothing funny about this in the humourous sense of the word – especially since in the 50’s, the government of the province of Quebec decided to shut down many mental institutions (that is probably not the most politically correct name) and thus ended up putting many mentally unstable people on the street. Many of these are either still around today and/or had kids that are for genetic and environmental reasons also on the street today… that the government would even consider saving money in a short time frame and cause such a long term social problem blows my mind, but that’s what we get for being part of a short-sighted political/economic society. Most of the homeless do NOT beg for money (which is the exact opposite of what I thought, apparently) – only 5% of the homeless actually beg for money! The reason? They simply are too proud to face strangers and ask for money… but the few that do, are raking it in, since if you’ve ever watched a street corner with a beggar on it and high pedestrian traffic, they can make $20K per year tax free pretty easily (which is the equivalent of $30-$35K)! Also, every single homeless person in Montreal has an indoor place to stay 365 days of the year. So when you see some of them sleeping outside in the winter or when you hear about a homeless person dying of cold in Canada’s tough winter it is due to his total disconnect from reality and not due to the lack of available free heated space in the community centers. There are 25,000 homeless persons in Montreal, a city of ~3.5 million inhabitants. 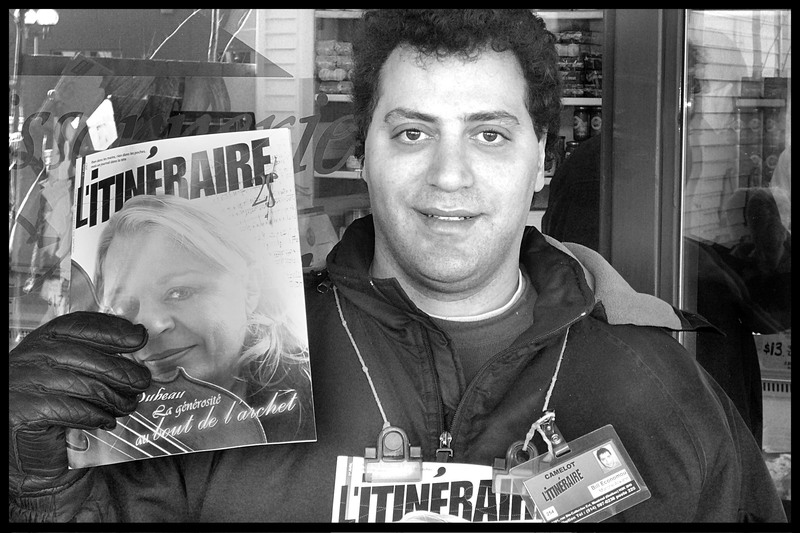 L’Itinéraire’s director is also the president of the North American association of street papers since he runs the one in Montreal so well (it takes them on avg 3 years to get someone off the street as they follow their street paper vendors with nurses and psychologists).